Champagne Drappier has announced the release of two new products that will allow consumers to directly compare its wines matured in seawater, compared with the traditional wine cellar. 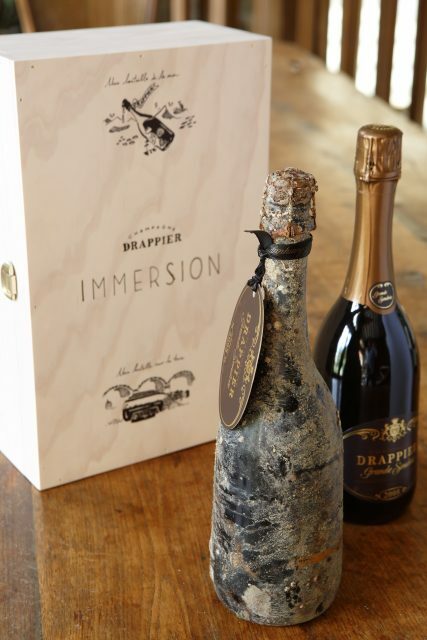 Having first experimented with sea-ageing back in 2013, Champagne Drappier has now released two twin-packs of its wines so that oenophiles can taste the results. Speaking to the drinks business before the first experiment, Michel Drappier said that a Drappier customer in Saint-Malo, named Yannick Heude, had inspired him to experiment with underwater ageing. Michel added that Heude, a local wine shop owner, had been submerging wines in the sea for many years. Having tasted some of Heude’s samples, he was impressed with the results and decided to age some of his own wines underwater. In June 2015, the Champagne house conducted a second experiment, submerging a number of its bottles in the sea, off the coast of Brest, in Brittany. During the project, called ‘Immersion’, the bottles were kept underwater at the same temperature and light level as those stored in Drappier’s cellars. The wine was kept at a depth equal to the pressure that compresses gas in the bottle. The bottles will be available in selected retail stores in the UK, including Handford Wines, as well as in France, Italy and Japan in the new year, and will take the form of two twin-packs, containing one bottle aged under water, the other in Drappier’s cellars. Housed in a wooden box, complete with ink illustrations by the house’s creative director, Charline Drappier, the Immersion series offers a ‘unique tasting experience’ that provides the chance to compare different ageing conditions. Each ‘immersed bottle’ is delicately packaged so that the shells, which grew on the bottle as it aged, are not damaged. Consumers can choose between the Brut Nature twin pack, priced at €90 (£81) and containing 100% Pinot Noir, or the Grande Sendrée 2008 twin pack priced at €190 (£167), a single-vineyard blend of 55% Pinot Noir and 45% Chardonnay. Grande Sendrée, Drappier’s prestige cuvée, is produced from organic vines grown in a deep limestone subsoil, with its terroir described as “the foundation of its finesse and power”. It is partly aged (32%) in French oak barrels and hand riddled, then stored sur lattes for more than six years. It then receives a relatively low dosage of 4.5g/l to retain the wine’s minerality, and remains unfiltered. Champagne Drappier refers to the 2008 as a special year, with a “clear blue spring sky” that resulted in a long summer ripening period. The grapes were harvested with high levels of acidity and a complex aroma-flavour profile. Its Brut Nature, containing less than 2g of residual sugar, has been produced with the minimal use of sulphur, and is described as having an “ample palate with flesh of vineyard peach and a bouquet of aromatic herbs”. The grapes are sourced from 100ha of vineyards, predominately in Urville, where the Pinot Noir variety dominates. After bottling, the wine ages for at least 30 months sur lattes. Drappier says it is the ideal accompaniment to seafood, sashimi or goat’s cheese. Champagne Drappier owns 15 hectares of certified-organic vines, having gained the accreditation in 2014 following seven years of preparatory work. Along with employing sustainable vineyard practices, Drappier has laid claim to being the first Champagne house to reduce its carbon footprint to zero. The company has invested in a wind-turbine business and avoids using air conditioning in its cellars, instead using a free cooling system with isolated air-conditioning systems that are strategically placed throughout the property. Champagne Drappier’s UK importer is Berkmann Wine Cellars. Wow, the article mentions everything but the results of the ‘immersion’. I suspect that if the results were positive then Mr D would have said so. I have to say that I do love the sound of barnacles on the bottle though…very cool. Wow..I have tasted sea aged wine. It is very different to cellar aged. It does age faster and evenly. As the bottle is at the same temperature all over by conduction. the correct temperature and stop any sewage or other contamination from entering or being on the bottles. out as soon as it is released.